1999 Arizona Wildlife Views: Special Edition. Phoenix: Arizona Game and Fish Department. Filled with color photos and life histories of Arizona's birds (including a chapter on hummingbirds), lizards, snakes, amphibians, bats, and mammals. 2000 A Natural History of the Sonoran Desert. Tucson: Arizona-Sonora Desert Museum Press. Co-published with The University of California Press. 1993 Shrubs and Trees of the Southwest Deserts. Tucson: Southwest Parks and Monuments Association. 1998 The Redrock Canyon Explorer. Talent, OR: Nature Works. Each page includes an illustrated natural history story about geology, plants, animals and other wonders of canyonland country. Facing pages are filled with interesting related facts. Although this book concerns the canyon environment north of the Sonoran Desert, many of the subjects are the same as or similar to those of the Sonoran Desert . 1995 Indian Uses of Desert Plants. Palm Springs, CA: Palm Springs Desert Museum. Fifteen desert plants are pictured with text on how they are used by native people. 1999 Rattlesnakes! Palm Springs, CA: Nature Trails Press. 2000 Saguaro. Palm Springs, CA: Nature Trails Press. 1997 The Sonoran Desert: A Brief History. Palm Springs, CA: Palm Springs Desert Museum. An introduction to the natural history and features that make the Sonoran Desert different from other North American deserts. 1993 Scorpions! Palm Springs Desert Museum, 101 Museum Drive, Palm Springs, CA. A 28 page booklet giving answers to frequently asked scorpion questions. 1995 Wild Foods of the Sonoran Desert. Tucson: Arizona-Sonora Desert Museum Press. 22 page colorful booklet tells of the native uses of desert plants. 1985 Flowers of the Southwest Deserts. Tucson: Southwest Parks and Monuments Association. Flowers are arranged by color. Line drawings, descriptions, and uses by native people are included. 1993 Saguaro National Park. Tucson: Southwest Parks and Monuments Association. An introduction to the land of the saguaro, including prehistory, recent history, geology, plants, and animals. 1998 Desert Life, A Vocabulary/Vida Desertica, Vocabulario. Tucson: Arizona-Sonora Desert Museum Press. English-Spanish and Spanish-English translations for hundreds of natural history words with the emphasis on Sonoran Desert terms. Tucson Wildlife Viewing Guide. Tucson: Arizona Game and Fish Heritage Fund. 14 sites in and around Tucson where we can see wildlife. 1997 Strangers in our Midst: The Startling World of Sonoran Desert Arthropods. Tucson: Arizona-Sonora Desert Museum Press. 22 page colorful booklet tells about the desert's insects, arachnids, and other many-legged creatures. 1995 Poisonous Dwellers of the Desert. Tucson: Southwest Parks and Monuments Association. Descriptions and habits of the common venomous animals (and those mistaken for venomous) of our desert, plus information on treatment of bites, stings, etc. 1996 Desert Dogs: Coyotes, Foxes and Wolves. Tucson: Arizona-Sonora Desert Museum Press. 22 page colorful booklet tells about coyotes, foxes, and wolves. 1996 Southern Arizona Nature Almanac. Boulder, CO: Pruett Publishing Company. A seasonal guide to Pima County and beyond. Each chapter covers a month's worth of natural happenings you are likely to experience. 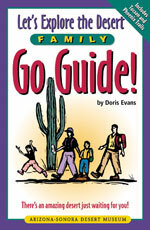 1997 The Great Saguaro Book. Berkeley: Ten Speed Press. Information, lore, legend, life cycle, and native uses of the saguaro. 1980 Sonoran Desert - The Story Behind the Scenery. Las Vegas: KC Publications. 1997 All About Saguaros. Phoenix: Arizona Highways. An Arizona Highways magazine size publication with many photos, life history, and interesting facts about the saguaro. 1994 101 Questions about Desert Life. Tucson: Southwest Parks and Monuments Association. 1998 Desert Waters: From Ancient Aquifers to Modern Demands. Tucson. Arizona-Sonora Desert Museum Press. 22 page colorful booklet tells of water use from ancient aquifers to modern demands. 1998 Arizona-Sonora Desert Museum Book of Answers. Tucson: Arizona-Sonora Desert Museum Press. 1995 The Secret Lives of Hummingbirds. Tucson: Arizona-Sonora Desert Museum Press. 22 page colorful booklet tells about the natural history of hummingbirds. 1986 Saguaro: A View of Saguaro National Monument & the Tucson Basin. Tucson: Southwest Parks and Monuments Association. 1994 House in the Sun: A Natural History of the Sonoran Desert. Tucson: Southwest Parks and Monuments Association. The Sonoran Desert is the "house in the sun." Longtime naturalist, George Olin, explores the many facets of its ecological story. 1982 Mammals of the Southwest Deserts. Tucson: Southwest Parks and Monuments Association. 1989 Venomous Animals of Arizona. Tucson: University of Arizona, College of Agriculture. An excellent reference for identification of venomous arthropods and reptiles and plus informaion about the animals often mistaken for being dangerous. 1992 The Great Southwest Nature Factbook. Bothell, WA: Alaska Northwest Books. 1995 Meet the Wild Southwest. Seattle: Graphic Arts Center Publishing Company. Learn about the plants, animals, human cultures, and natural features of Arizona, New Mexico, southern Utah and Colorado, and west Texas. 1994 Learning About and Living with Insects of the Southwest. Tucson: Fisher Books. Describes and illustrates over 120 of the most common arthropods likely to share your home and neighborhood.